A boarded up church dating to 1884 at 912 West Chestnut Street between 9th & 10th Streets could one day see new life as a sort of community center for the West Downtown – East Russell neighborhoods. 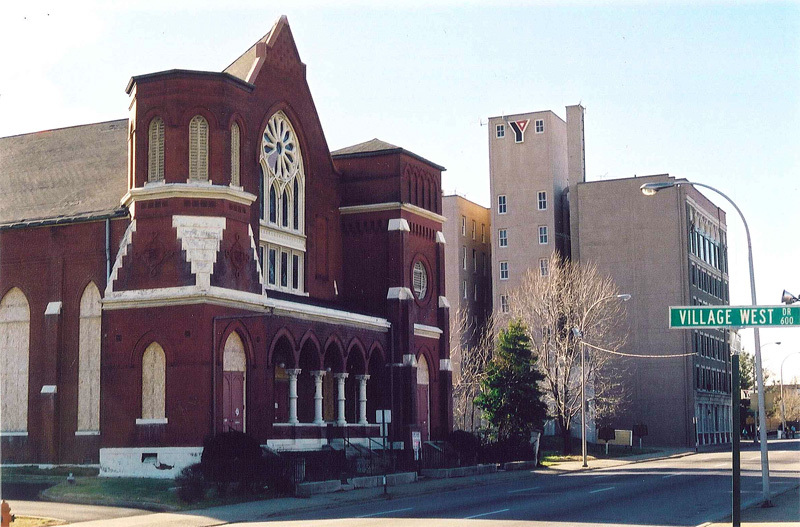 The old Quinn Chapel Church has a long and interesting history and is now owned by the adjacent YMCA of Greater Louisville at Chestnut and 10th Streets. Rodney Martin, District Executive Director of the YMCA, told us that options for the building are currently being considered and a plan could be announced as early as the end of the year. While there are currently no final plans to discuss, it’s worth taking a look at the Gothic Revival church building and its history to discern some clues as to its future use in the neighborhood. Quinn Chapel is one of the last remaining historic buildings in the area, as we pointed out with a view from the top of the Glassworks building. (If you look in the 1906 photos, you can see the church, with its long-gone steeple just in front of the L&N building). As the church has decayed over the years, it’s welcome news that it could soon see better days. 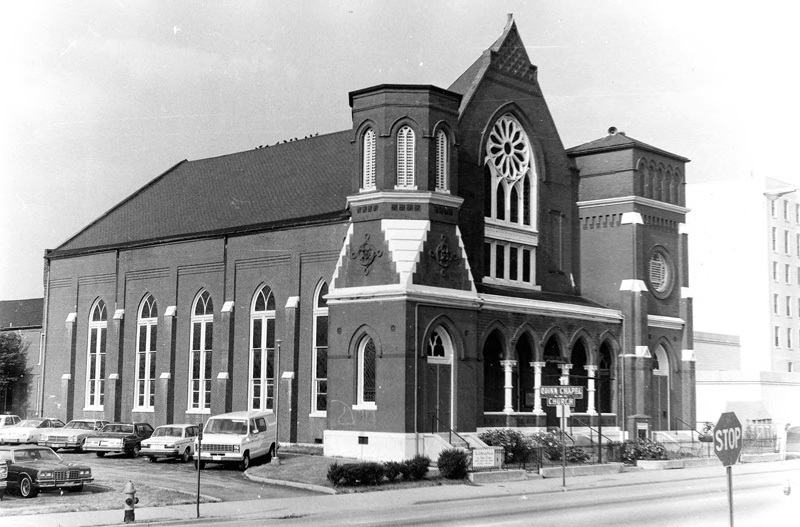 Originally called the Chestnut Street Baptist Church, the building was designed by architect Henry Wolters and features ornate terra-cotta tiles embedded in its brick facade and a cloistered front porch complete with Gothic arches. Wolters was born in Germany and educated at the famous Ecole des Beaux-Arts in Paris. He maintained offices in Louisville and New Orleans where he designed classic Victorian architecture all through the South. Above the arcade, a rose window sits above four arched windows. (An interior view circa 1980 shows the grand hall, but it’s unclear what part of the building is illuminated by the rose window. Perhaps a space above the main sanctuary.) A steeple once rose from an octagonal tower on the east (left) side of the building. movement and gained the church the title of the ” Abolistionists’ church”. 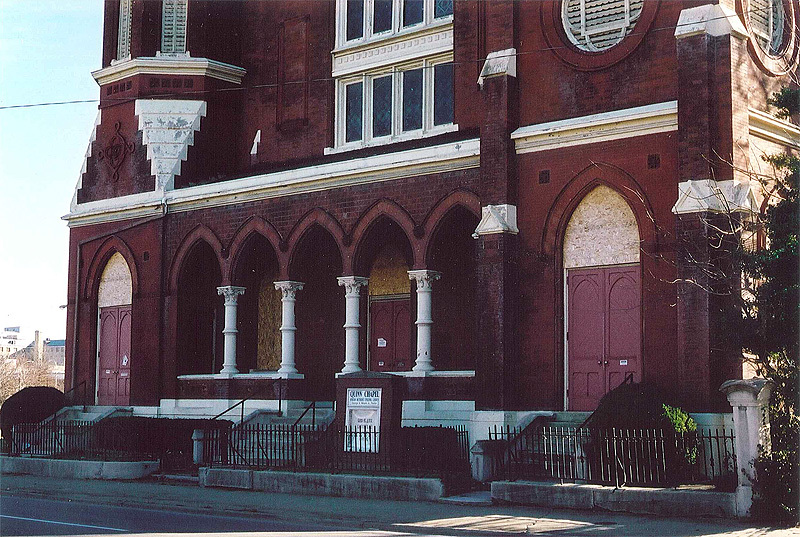 The Chestnut Street Baptist Church was built around 1884 and1 later known as the Weaver Baptist Church. The church became the fifth home of the Quinn Chapel A.M.E. congregation in 1910. The Quinn Chapel congregation is one of the oldest black churches in the city and had its beginnings in 1838 as the Bethel congregation. The church takes its name from Bishop Paul Quinn, an early black church leader and abolitionist and the first bishop of the African Methodist Episcopal faith to visit Kentucky. The congregation of Quinn Chapel was comprised of free men who were active in the anti-slavery movement and gained the church the title of the ” Abolitionists’ church”. The first school for black children in Louisville was started by the congregation in the late 1840s. I just found out this evening that I will get to go and film inside this building tomorrow for a school project. We’re filming a documentery based on the Louisville civil rights driving tour that was featured in the paper back on January 12. I’ve never been inside, so I was wondering if there was anyone here who is familiar with the building and could tell me what parts are most significant/that we should be filming. I had hoped to speak with someone from the congregation first, but this just came up suddenly. I know that this is a last minute request, so I’ll understand if I don’t get any replies. I would be happy to assist with an architectural analysis. I know the building well and am sorry to see it in such disrepair. Please get in touch. I can also put you in contact with some Civil Rights leaders from years past that may be willing to provide interviews.